Celebrities are saying some very interesting things in terms of the two back-to-back hurricanes that are causing much devastation in America and other parts of the world. Yesterday, Hunger Games star Jennifer Lawrence blamed Trump voters for the storm. Now, Kirk Cameron is claiming that God has reach down from the sky to teach us all a lesson in humility. While some are making Cameron out to look the fool, his comments are a lot more reasonable than what Jennifer Lawrence had to say. At least in an apocalyptic biblical sense. Cameron believes he has Irma and Harvey all figured out. He claims to know why these hurricanes have arrived to rip millions of families from their homes. And he places the blame on humanity itself. The former teen heartthrob and star of 80s sitcom Growing Pains is now an evangelical Christian who has helped produce some very popular religious movies over the past decade. He sent a post out on Facebook to warn us all that God is in a punishing mood, and has come to exact his revenge. As Irma begins to set her almighty foot in Florida, Cameron loudly wags his finger, blaming all the destructive and devastating Hurricane carnage on humanity for our collective sins. This is God teaching us all 'repentance'. He goes onto explain himself. "This is a spectacular display of God's immense power. When he puts his power on display, it's never without reason. There's a purpose. And we may not always understand what that purpose is, but we know it's not random, and we know that weather is sent to cause us to respond to God in humility, awe and repentance ... Maybe share that with your kids when they ask why this is happening." 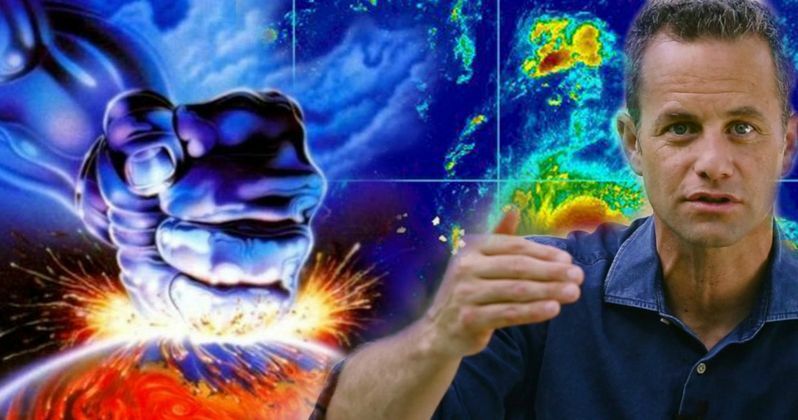 Kirk Cameron is teaching Old Testament scripture in his description of the storms, which may actually frighten children, no matter what side of the religious spectrum you may fall. He talks of a very scary god. But also brings love into the equation, to soften the blow. "[God] causes [storms] to happen for punishment, or to water his land to demonstrate his faithful love. How should we look at two giant hurricanes coming back to back like this? Do we write them off as coincidence? Do we write it off as a statistical anomaly? Wow! Who would've thought? Is it just Mother Nature in a bad mood?" In her comments from yesterday, Jennifer Lawerence also brought up Mother Nature, and a lot of celebrities have used the hurricanes to push messages of global warming, taking advantage of President Trump's stance on the matter in negative ways. Kirk Cameron's notions shouldn't be completely laughed off or turned into a joke. That is disrespectful of his beliefs as an individual. And he's only utilizing his freedom of speech while he still has it. As is Jennifer Lawrence. Though, what they are saying is both wild and can easily be misconstrued. As pointed out by Entertainment Weekly, many scientists would agree with Kirk Cameron's sarcastic remarks. There is something brewing that increases these extreme weather events being witnessed around the globe. And a lot of people are saying a lot of wild things, though not from such a loud platform with as many listeners. It is probably best to find your own way to speak to children about what is happening. Though, it is noted that Irma is probably stronger because of Harvey, and scientists have been pointing out the increase in extreme weather patterns for years. If you are not directly in the eye of the storm, and want to help, you can donate to the Red Cross at their disaster relief fund here.